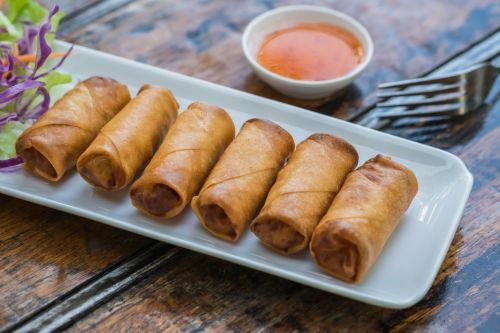 Menulog delivers for Chopsticks Vietnamese Cuisine so you'll be able to track your courier on a map. Carrot, taro, onion, glass noodle and snow fungus wrapped in egg wrap. Served with sweet and sour sauce. Pork, prawn, carrot, taro, onion, glass noodle and spring onion wrapped in egg wrap. Served with sweet and sour or in house dipping sauce. Tenderloin chicken served with peanut dipping sauce. 1 x Fresh Roll, 1 x Spring Roll, 1 x Grilled Minced Pork Skewer and 1 x Chicken Satay Skewer. Wok tossed lemongrass beef with onion, topped with peanut and dried onion. Comes with thin vermicelli noodle and a mixture of herbs, vegetables, rice paper and dipping sauce. 2 x Mixture of Minced Pork Skewer, 2 x Spring Roll, 2 x Prawn Skewer and 2 x Sliced Pork Skewer. Comes with thin vermicelli and a mixture of herbs, vegetables, rice paper and dipping sauce. Served with pate, mayonnaise, pickled daikon and carrot, shredded lettuce, spring onion, coriander, chilli and special sauce. Served with pate, mayonnaise, pickled carrot and daikon, shredded lettuce, spring onion, coriander, chilli and special sauce. Ham or chicken, egg, mixed vegetable and shallot. 2 x Marinated Pork Chop. Served with boiled rice, fried egg, pickled carrot, lettuce, tomato and fish sauce. Wok tossed marinated beef, onion and capsicum. Served with boiled rice, salt and pepper lemon dipping sauce. Slow cooked beef stew. Served with boiled rice, salt, pepper and lemon dipping sauce. Stir fried vegetables with beef, chicken, tofu, seafood or combination on a bed of crispy egg noodle. Combination of pork meatball, spring roll, sliced pork skewer on a bed of vermicelli noodle, lettuce, bean sprouts, pickled vegetable, topped with mints, peanut, dried onion and fish sauce. Wok tossed lemongrass beef, on a bed of vermicelli noodle and lettuce, pickled vegetables, beans sprout, topped with mints, peanut, dried onion and fish sauce dip. Wok tossed lemongrass chicken on a bed of vermicelli noodle, lettuce, pickled vegetables, beans sprout, topped with mints, peanut, dried onion, and fish sauce dip. Flat rice noodle, vegetable broth, a combination of tofu and green vegetable topped with thinly sliced onion, shallot, basil, bean sprouts, chilli, lemon and hoisin dipping sauce. Flat rice noodle in chicken broth and poach chicken breast. Served with thinly sliced onion, shallot, basil, bean sprouts, chilli, lemon and hoisin dipping sauce. Flat rice noodle in beef broth, a combination of rare slices of beef, beef briskets, tripe and minced beef ball. Served with thinly sliced onion, shallot, basil, bean sprouts, chilli, lemon and hoisin dipping sauce. Tofu, shredded lettuce, pickled vegetable, mint, dried onion and roasted peanut. Served with prawn cracker and fish sauce dip. BBQ chicken, shredded cabbage, carrot, pickled onion and topped with mint, roasted peanut and dried onion. Served with prawn cracker and fish sauce dip. Wok tossed beef with onion, shredded lettuce, pickled onion and roasted peanut. Served with prawn cracker and fish sauce dip.